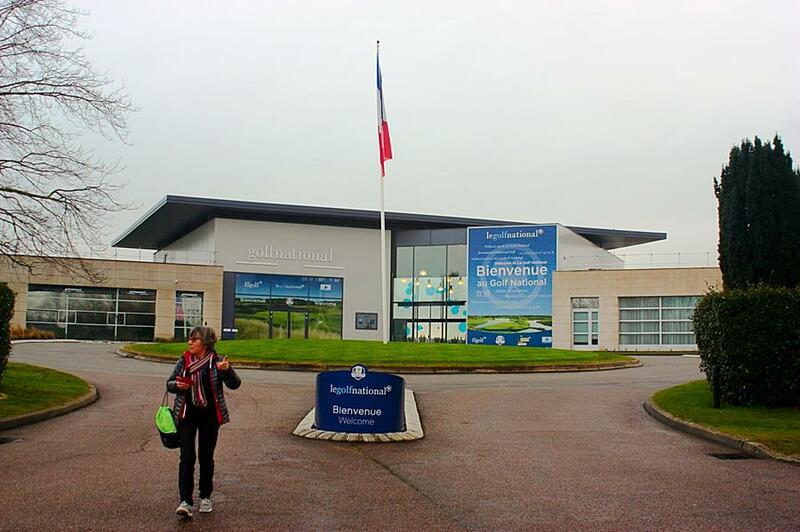 Although only built in 1990, Le Golf National is a much more established than its age suggests. Designed by architects Hubert Chesneau and Robert Von Hagge. It is located in Saint-Quentin-en-Yvelines, southwest of central Paris, just 10k from the world-renowned Palace of Versailles, and only 4 hours drive from Calais. 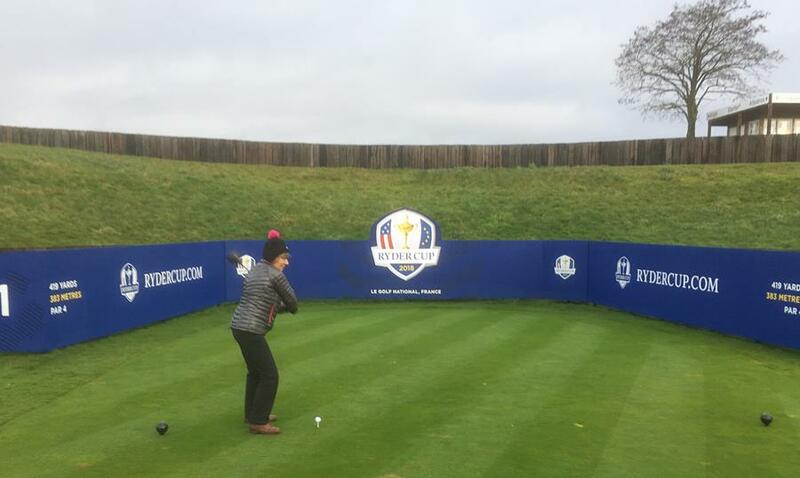 However, Le Golf National differs from any other Ryder Cup venue in that it is a Public course. This means that there is no ‘club’ as such, and no ‘members’, only Pay & Players. The course is also unique in the sense that it is owned by the French Golf Federation (FFG). In September 1985 the President – Claude Roger Cartier – with his committee approved the creation and development of a “National Golf” venue and it was quickly completed and opened by the French Minister for Sports by R. Bambuck in October 1990. The management team is small but effective and is headed up by Englishman Paul Armitage (who has been at the club since 2014). This means it now rates among the best in the world. In addition, the course boasts an incredibly committed team of greenkeepers and advisors from the European Tour (preparing the track for Sept) but high praise was given to Spanish born Head Greenkeeper Alejandro Reyes, who at only 33 years old is the youngest person to ever prepare a Ryder Cup course. The grounds, which cover 139 hectares, were originally flat and bare having been used as agricultural land since Louis XIV and the Château de Versailles when it was one of the areas where wheat was farmed. Constructed to give a ‘stadium like’ feel to events and in time for the 1991 Open de France, The Albatros course has been their near-permanent home for the past 25 years. In the wind and rain of the first day of the aforementioned first Open de France played on The Albatros, Nick Faldo deemed his score of 71 “Tough but fair”. The Open de France had found its home. Other players from the European Tour also voiced their approval, mentioning The Albatros as one of their favourite courses. In addition, to the flagship championship course, there is also The Aigle which was opened in September 1991, preceded by the 9 hole, Birdie Academy Course a few months before. The venue has recently undergone a €7 million renovation programme to transform this national golf centre. The Championship Albatros course is now a globally recognised course with slick greens and vast undulating fairways dotted with large and small water hazards and innumerable links-style bunkers. The course is consistently ranked in the World’s Top 100 Courses and Europe’s Top 10 by Golf World (UK) magazine. 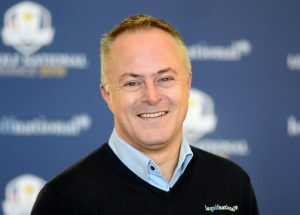 We spent a long time chatting with GM – Paul Armitage – while in Paris and he shared much of his vision for the club. This included an insight into the future of French Golf and while all eyes are focused on The Ryder Cup in 2018, it’s worth noting that Paul and his team have been successful at bidding to be the host venue for the Paris Olympics too. Meaning, not only is there a legacy planned for the course but Le Golf National is also now home to the next generation of French golfers – with many young players to see as you make your way around the campus. More from Paul in the TSG February newsletter. As you walk to the 1st Tee, you can sense, you can feel, you can hear the crowd: you realise that The Albatros is the perfect battlefield for one of the greatest duels in Sport. The spectacular landscape has been created 30 years ago and recently remodelled. You cannot believe that it was constructed on old farmland. It took more than 1k+ truckloads of rubble from Paris, tons of sand has been laid on the fairways and clever use of rainwater to create majestic lakes, ponds & streams. Only the best sand has been used for this top European course, home of the French Open since 1991 and a favourite of the European players. There is a lot of wildlife, from birds of prey to fish, frogs & butterflies, rabbits and many other wild creatures. The Albatros is a public course, so anyone with a minimum 28 handicap may venture and face the challenges ahead. The experience will be with you for the rest of your life. Every hole is well conceived, extremely aesthetically presented. At this time of the year, the landscape is bare, so the scenery feels delicate, imagine a very “dainty” ink/pen drawing. Obviously the Spring, Summer & Autumn will be a lot greener. A super space for the avid photographer with a suitable lens & eye for beauty. We played the course on the 10th of January 2018, after 42 consecutive days of rain, the condition of the course is absolutely immaculate, from Tee boxes (choice of 5 colours), to the large & sweeping & undulating fairways, carpet-like feel, to the slick & well-shaped greens. All with the very subtle slopes towards the water hazards, to the softest and driest sand I have ever played from and were always nicely raked. However, don’t venture off the fairways, as the rough will punish you! Many other golf courses in the Paris region were closed due to the wetness but The Albatros stood stoically. All the paths are tarmac, the signage is good, lovely course planner endorsed by the Greenkeeper at each hole, a ball washer & towel, and bin. The walk is not too strenuous but there are elevations as we are playing a Links type course. We did not have much wind on the day but any wind will alter your thinking. The pins position can be tricky, I believe the 1st hole will have nine pin positions, while the green is sloping towards a large lake, that will come into play on the 2nd hole as well. There is a toilet at the end of the 6th hole which also serves the golfers need when coming down the 13th, a water fountain is also located at this point. 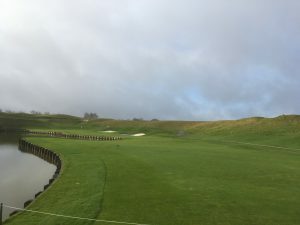 HOLE 1 – Par 4, I was so excited to be at Le Golf National’s Albatros Course, that the 1st hole stole the show & set the tone of what to come, I got a good score too: a dogleg right, slightly downhill, wide fairway narrowing to the green with large expanse of water on the left. The pin position can be tricky as the green slopes towards the water. HOLE 7 – Par 4, This was Ian’s favourite hole. The 2nd hardest hole on the course, it begins with an uphill drive to a plateau, leaving a long iron shot over ‘moguls’ to a very well protected and sloping green – this hole could be a real a card-wrecker! HOLE 13 – Par 4, A downhill dogleg right, leftish to the green, with a fairly long carry to the fairway sloping to a water hazard on the right, a lake preceding the green. Must be very pretty in the Springtime with all the foliage on the trees surrounding the approach. HOLE 16 – Par 3, One of the 4 stunning final holes, short but water on the right and three large bunkers guarding the approach to the green. The day we played I had to shout Fore! as my lovely shot went towards one of the bunkers, lovingly attended by one of the greenkeepers, who kindly allowed me to take a free drop… I was very apologetic, who wants to injure such a great team! The final four holes provide the most beautiful layout, creating an incredible finish: The 15th & 18th greens are islands. I had the privilege to accompany Monsieur Mullins on this two-day tour of this extraordinary scene at the Golf National. There is a nice atmosphere in this very well managed golf venue (there are 2 other courses, The Aigle 18 holes, and The Oiselet, a 9 Academy course), a very large open-air driving range, putting greens, a Clubhouse modernly furnished with bar for drinks & food. A dedicated team, who understand what a golf course & surroundings need to be like, how to create an image, how to treat its visiting golfers, one can feel it is managed with “LOVE” (see above). Extremely warm, friendly & relaxed welcome in the chic Pro shop/Reception (it tops Wentworth’s), gorgeous & technical golf clothing with all the other goodies one needs for a good round, lots of the 2018 Ryder Cup memorabilia, a very artistic photo book by Claude Rodriguez that got my eye. My recommendation is to go, and go now! You will have a very enjoyable experience on one of the Top 10 European golf courses, L’ Albatros will make history in the 2018 golfing world as its only the second time ever the event has been held outside of Great Britain. For me, it was a proud moment to be on my home ground, I felt spoilt, I hope from the bottom of my heart that many “Social Golfers” will embrace the opportunity to play The Albatros course before end of August (or from October) and remember, if you need a native speaker, think of me…. 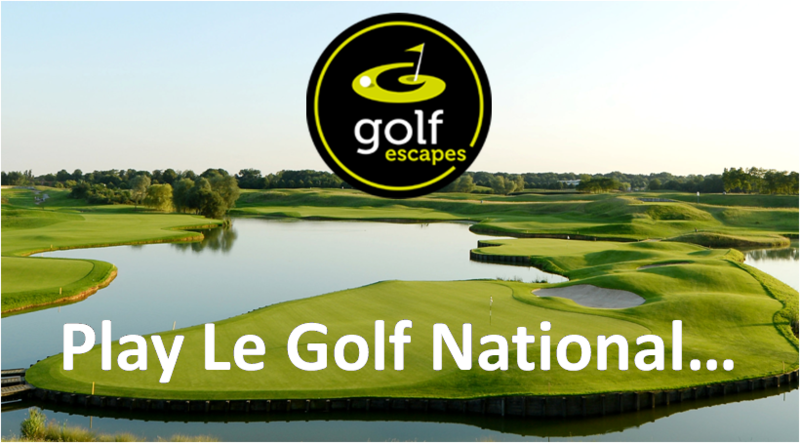 TSG official travel partner Golf Escapes can provide not only the accommodation and tee times at Le Golf National but all the help you will need in booking your Eurotunnel shuttle. We used these experts to make our booking and it couldn’t have been easier. Whether you want to play the course OR attend the event itself, Golf escapes can help. 1. 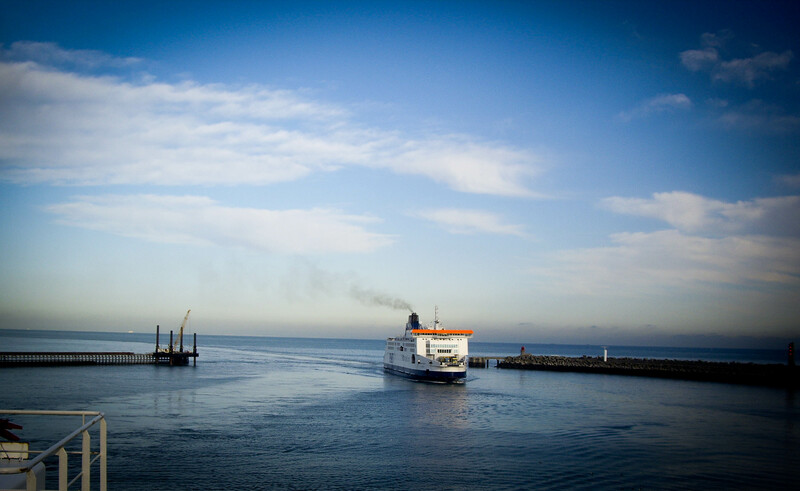 Le Shuttle Folkestone – arrive 45 minutes before departure to ensure a smooth experience. 2. Don’t forget the one hour time difference if you are planning to play golf on your arrival day. 4. Know your obligations when driving in France e.g. warning triangles & high visibility jackets are a legal requirement. As are headlights reflectors, roadside recovery, a spare headlight bulb, your logbook and a copy of your insurance. Finally, note, the course itself only closes just under a month before the big occasion. 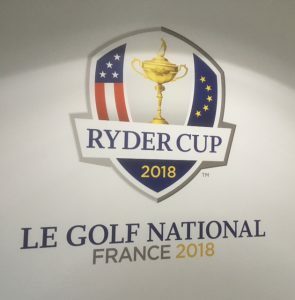 There is less than a year to go until the 42nd Ryder Cup at Le Golf National, France (September 28-30, 2018). 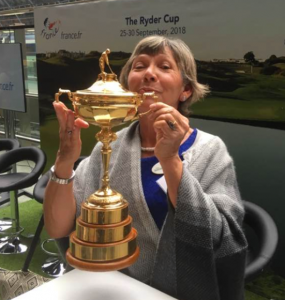 As such, golf fans and commuters enjoyed their own rendezvous with one of the world’s most famous sports trophies, when it went on public display at London St Pancras International…. Having returned from Paris and the ‘Year to Go’ celebrations, which saw European and the United States Team Captains Thomas Bjørn and Jim Furyk engage in a range of promotional activities including hitting balls off the Eiffel Tower. However, the trophy was the star attraction at Eurostar’s London terminus on Thursday, October 26th. Fans were able to sit on the European Captain’s golf car and have ‘selfie’ photographs taken with the trophy (#FeelFranceRC18). In 2016, France welcomed 82.6 million international tourists, including 11.9 million from the UK via convenient train, ferry and air links. Figures for the first half of 2017 indicate a 5% year-on-year increase in the number of visitors to France from the UK. Among the most popular golf regions for UK golfers, are Normandy, Brittany and Provence, as well as the Paris region. Le Golf National is just 21 miles from the centre of Paris. The number of golfers travelling to France could be boosted further after Eurostar was announced as Official Supplier of The 2018 Ryder Cup, carrying representatives of the European Team to Paris next September. 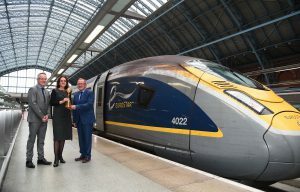 “In just under a year’s time, representatives of the European Team will set off from London St Pancras International and travel by Eurostar train to Paris”. 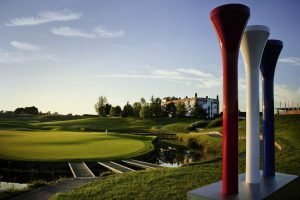 Le Golf National, France, will host The 2018 Ryder Cup from September 28-30, 2018, when Europe will try to regain the trophy following defeat at Hazeltine National in the United States, last year. The team, under the captaincy of Thomas Bjørn, will be looking to extend an impressive winning record on home soil which stretches back to 1997. France is one of the most popular golfing destinations there are amongst UK golfers, and it’s not hard to see why; home to some of the most beautiful golf courses in the world, France also boasts fascinating culture, incredible cuisine, absorbing history and spectacular and varied scenery. With over 550 golf courses to choose from, all with differing landscape, attractions and degrees of difficulty, a French golf holiday really will leave you spoilt for choice. From golfing in the majestic and romantic surroundings of Paris to teeing off against the beautiful blue backdrop of the Mediterranean Sea in the South, you will find your perfect golf location here. A French golfing trip offers you the chance to combine your game with a city break or beach holiday – or for more adventurous types, you can mix golf with skiing in Biarritz, wine tasting in Bordeaux, or even mountain climbing in the French Alps. Accessible from the UK by plane, car, ferry or train in just an hour or two, France is the obvious choice for the ultimate golfing holiday! 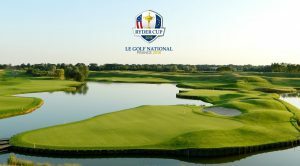 Le Golf National’s two 18-hole, par-72 championship courses and short academy layout made it the clear choice to be the permanent host of the French Open – and now Le Golf National will play host to the Ryder Cup in 2018. 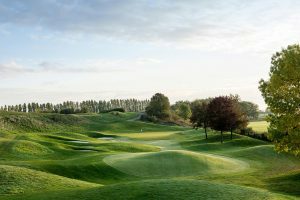 Thought by many to be the best golf course in France, Golf National was also voted the fifth best course on the whole continent by Golf World magazine in 2011. The natural park course stretches over 7,300 yards from the back tees and is decked with small lakes, sweeps of long grasses, gorse bushes and dune-like landscaping, all of which come together to make Golf National arguably one of the most challenging courses in France, as well as one of the best! A must for all golf enthusiasts whatever their level, visitors can play at Golf National for a green fee of € 90 on weekdays and € 130 on the weekends. Founded in 1921 and set in a magnificent 500 acre estate, Golf Club de Lyon hosted the French Open in 2001 and is considered one of France’s most beautiful courses. Stretching an impressive 6,700 metres in total, the course is bordered by the River Rhone on one side and dense woodland on the other, ensuring you breath-taking views whichever direction you’re teeing off in! Designed by French architect Hugues Lambert, Golf Club de Lyon has two full 18-hole, par-72 golf courses – ‘Les Brocards’ (young Roe deer) and ‘Le Sangliers’ (wild boar). Visitors can play at Golf Club de Lyon for a green fee of €65 on weekdays and €80 on weekends, and anyone not especially interested in golf will enjoy having the vibrant city of Lyon right on their doorstep: known as the gastronomic capital of France, Lyon offers you more restaurants and cafes than you can imagine! Just a few miles away from the famous seafront at Cannes lies the fabulous Golf Country Club de Cannes-Mougin, an 18-hole Championship golf course which ranks alongside some of the best courses in the country. The 6,312 metre long course is also considered one of the most attractive. You will be able to enjoy spell-binding views of the Southern Alps mountain range as you tee off here, as well as a unique sense of tranquillity from this tree-lined course. The layout of this course is perfect to test your overall golfing skills, and there are plenty of attractive, expertly crafted and tricky holes to play. Visitors can play at Cannes-Mougin for a green fee of € 120, which gives them access to the full course, driving range, putting green, pitching green, and chipping green. Due to being so closely located to the UK, the northern parts of France share a very similar climate, with commonly cool winters and mild summers. However, the South of France is much warmer and usually experiences mild winters and hot summers. In general, the best months to golf in France are from June to September, although if you are playing in the South of France then October is usually still fine. You are advised to avoid taking your golf holiday during the wetter, colder months (from October/November to April). Travelling from the UK to France is straightforward, quick and inexpensive, and there are four popular modes of travel – plane, Channel Tunnel, ferry and train. If you are travelling with a car, or with a group of people, then the Eurostar or ferry is recommended. From Kings Cross St Pancras in London you can get the Eurostar to Paris, which takes about two hours and 15 minutes. Prices depend on the time of day but generally start from £44.50. From London airports to Paris, the flight time is about an hour. The cost depends on when you are going but averages out at about £60. October is the most expensive month to travel. You can get to France from Folkestone, Kent via the Channel Tunnel, which will take you to Calais. Prices start from £46 for one car and four passengers. You can choose to get the ferry from Dover to Calais; prices start from £10 for two people with a car, but are generally about £30. The journey takes just over two hours.